Lately I’ve been expanding my wardrobe with more skirts and tops. I have lots of dresses already, and I feel that I need to introduce something different to my wardrobe. My style always changes subtly from time to time, otherwise I will get bored of myself! I bought Pendrell blouse pattern by Tasia from Sewaholic sometime ago but only had the chance to try it now. I must say that I love it. So much that I made two in one day! 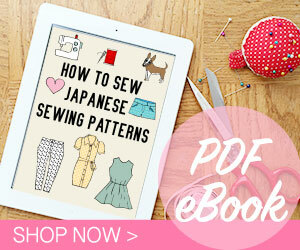 The instructions are very clear and I only need a couple hours to make one blouse, from tracing the pattern pieces to finish. 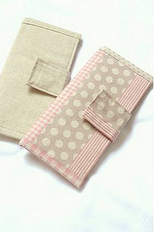 The fabric is found in a local fabric store with a cheap price. I don’t really know what it is made of, felt like some kind of polyester. I planned to use it as some kind of wearable muslin, and it is wearable indeed! The shape of the blouse and the way the sleeves drape are very lovely. I made view A of the blouse in size 2, the only alteration I made was shortening the bodice about 4 cm as I have a short bodice. Since I really like the blouse, I made another Pendrell with red lurik fabric that I bought in Indonesia. 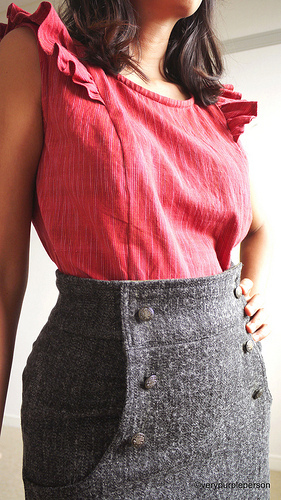 This is the same fabric as my green button-up skirt but in different color. Initially I made the same view A of the Pendrell, but the sleeves didn’t drape well due to the stiffness of the fabric. I ripped the sleeves and made new seam ruffles from view B, leaving the sleeve ruffles because I didn’t have enough fabric. But I didn’t have anything to wear them with! 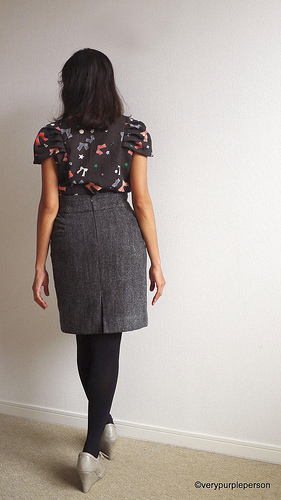 I turned to Burdastyle and found this all-time favourite, the Kasia skirt. This is not the first time I made Kasia skirt, a couple of years ago I’ve made it for my friend in polkadot corduroy. This time I used dark gray fabric that I found in the denim section of Yuzawaya. The label said that it was denim, but the fabric felt more like tweed or something. I don’t know, I really don’t have enough knowledge about fabric other than cotton and linen…. Anyway the fabric is perfect for my skirt! I shrunk the pattern by 92% and used size 38. This time I made it differently by moving the zipper to the back side of the skirt. 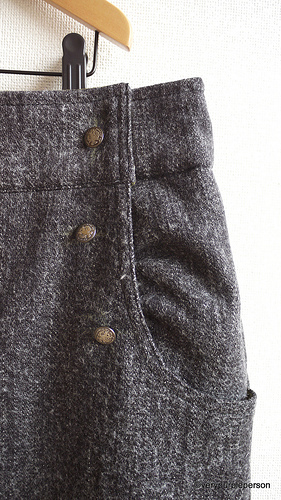 The buttons are merely decorations and the front flap is sewed to the skirt. The skirt also has lining because the fabric looks like it is going to be itchy. 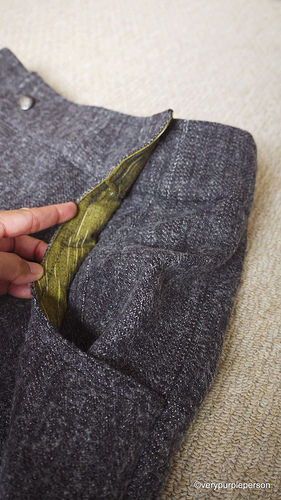 The front flap, pockets, and waistband are lined with leftover green lurik from my button-up skirt. I also reinforced the waistband with rigilene boning for added stability. 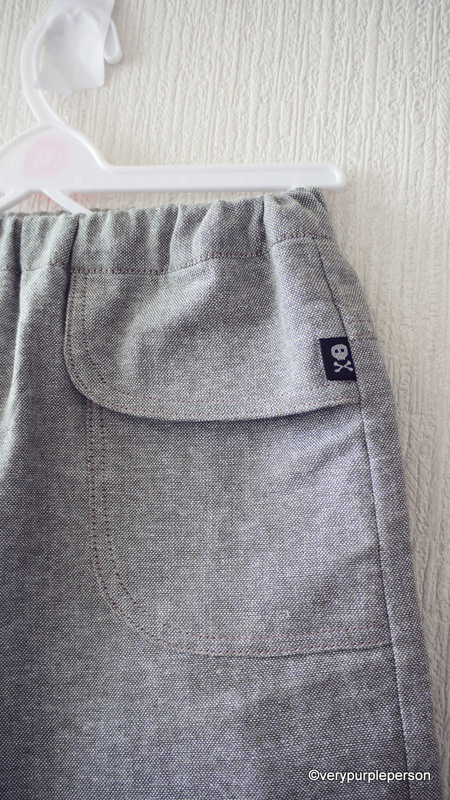 I used thin bias tape as casing for the boning and sewed them on the wrong side of the inside waistband. 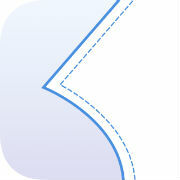 The boning makes the high waistband stay up and prevent them from rolling. I couldn’t eat too much while wearing this skirt, but I love the whole outfit! Blouses pattern is Pendrell Blouse by Sewaholic, size 2. 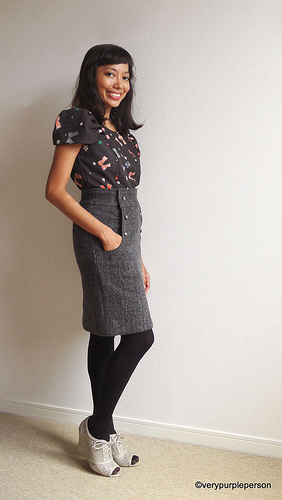 Skirt pattern is Kasia, free PDF pattern by Burdastyle, size 38 shrunk by 92%.